In retrospect, the game was lost at the opening coin flip. Two sets of captains made their way to midfield. Lehigh won the toss, and deferred. The Fordham captains came back from the coin toss, and chest-bumped the rest of the team – even though, technically, they lost the toss. Lehigh’s captains slowly walked back to the sidelines, slowly, and without, seemingly much emotion. It was then not too much of a surprise when Fordham eventually would jump out to an 8-0 lead and would never get ahead of the Rams, ultimately falling 43-14. Fordham, who averaged only 1.0 yards rushing per game in five contests going into this week, managed 189 yards rushing, including RB Tyriek Hopkins getting a 117 yards rushing on the ground, including a 20 yard TD run to put him over the 100 yard mark. QB Tim Demorat also had a terrific day through the air, getting 299 yards passing, most of the damage coming from two huge pass plays, an 87 yard pass to WR Corey Caddle and a 73 yard pass to WR Jonathan Lumley. Both completions were over the middle and became touchdowns after the receivers broke loose. A third long 45 pass to WR Austin Longi was also initially ruled a touchdown, but replay showed he was down at the 1. RB Hopkins then leaped over the top to punch it in. 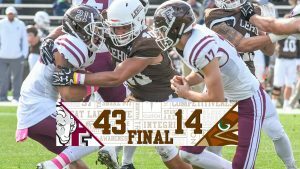 For the sixth straight contest, Lehigh failed to score more than 21 points in a football game. 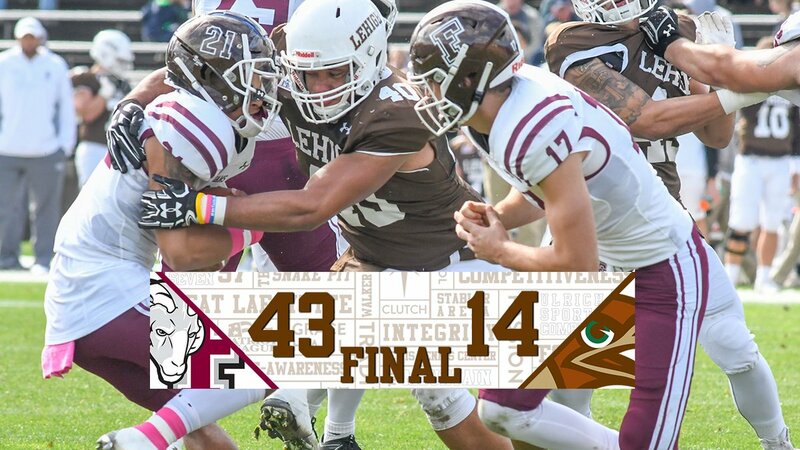 Down 36-6, WR Austin Dambach caught a late touchdown pass and WR Jorge Portorreal caught a 2-point conversion to make it 36-14 to conclude Lehigh’s scoring on the afternoon. A 5 yard Mayfield run late in the game would put the cherry on top for Fordham as they go 1-1 in Patriot League play. Lehigh falls to 0-1.